A picture is worth a thousand words; here is what I am talking about, from the comments on this post. By posting a very long formula into MathJax, not only have I caused my own comment to run off the edge of the screen (which perhaps I deserved), but the same has happened to all the other comments in the thread. Firefox 38.2.0, OS X 10.8.5. Bug also occurs in Safari 6.2.7. UPDATE I just deleted the comment, since it was inconveniencing others in the thread. Hopefully, this has left enough data to reproduce the bug. Remark (added on Oct 4, 2015): This bug report appears to be still pending. 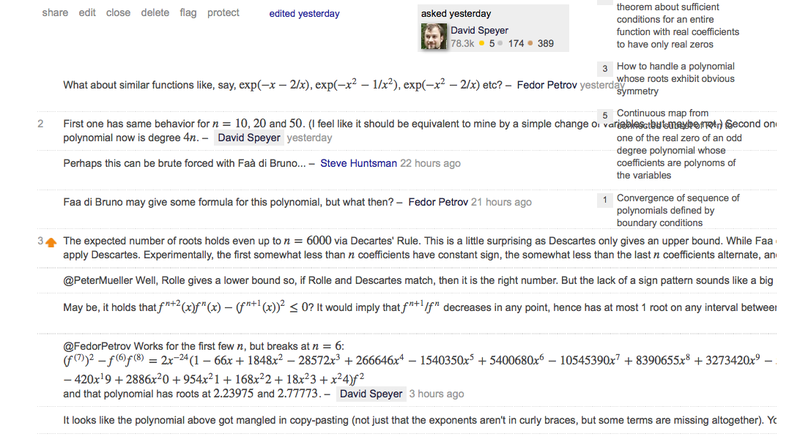 Browse other questions tagged bug mathjax comments .